Terror from Beyond the Daves wins the Rondo! It is with teary eyes of appreciation that we thank all of our readers and friends who helped make us “The Best Horror Blog” of 2011. 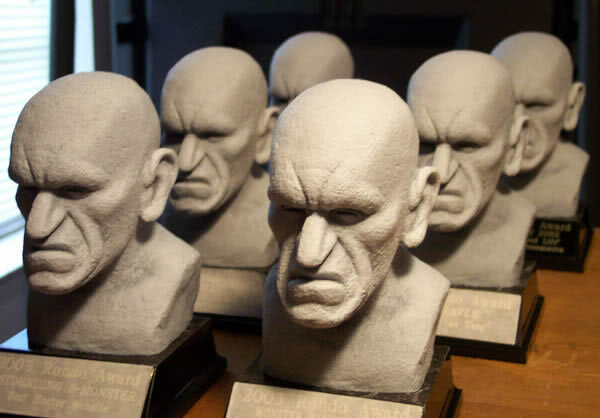 The Rondo’s are like the Oscars of Monsters and I’d been voting for my favorites pretty much since they began ten years ago. We started the site in July 2010 and were shocked last year when we were nominated. It seemed too good to be true and, while the adage “it was such an honor just to be nominated” might seem cliche,’ it was absolutely true in this case. We didn’t win but we came close and that was unbelievable to us. When I awoke this morning and saw the numerous texts heralding the news, I honestly had to check the calendar to be sure April 1st (Fool’s Day) had passed and this wasn’t a joke of some kind. I think I am still in a bit of shock. We want you to know that we are truly humbled by this award and know that we could not have done it without all your votes. We’d especially like to thank ALL of our friends in the Horror Host community for embracing us as they have and allowing us to cover them and their macabre exploits. We would also like to thank our readers who took the time to do this as well. It means more to us than you can imagine. NOTE: for full list of winners, click HERE! ← Those Crazy, Costumed Women at Horrorhound Weekend! Kongrats on your RONDO win for Best Blog of 2011! Thanks, John! We really appreciate this and are still in a bit of shock!